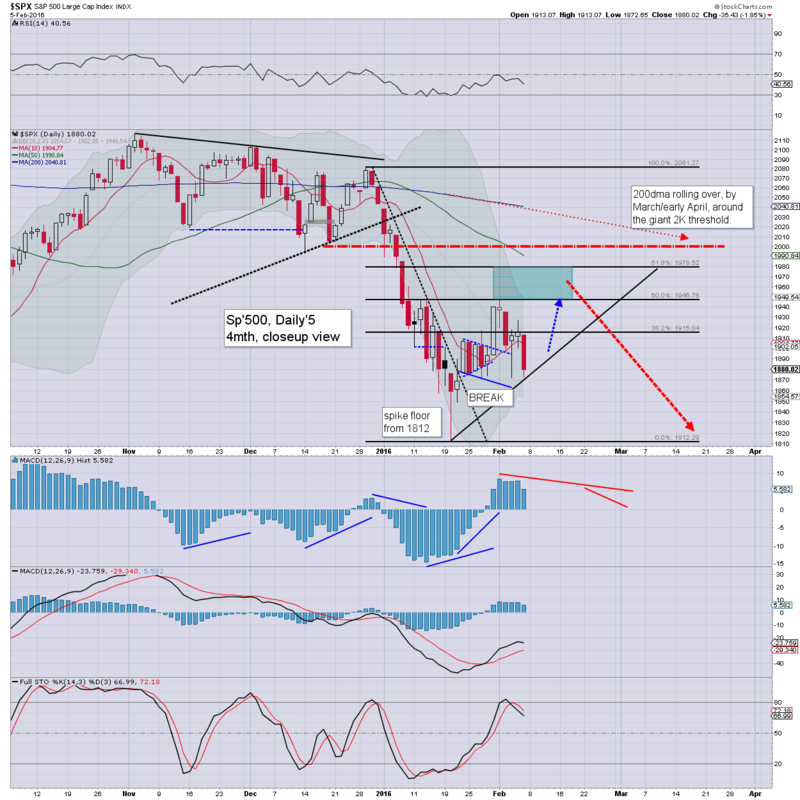 With an opening bearish week for February, the mid term outlook remains very negative for the US equity market. 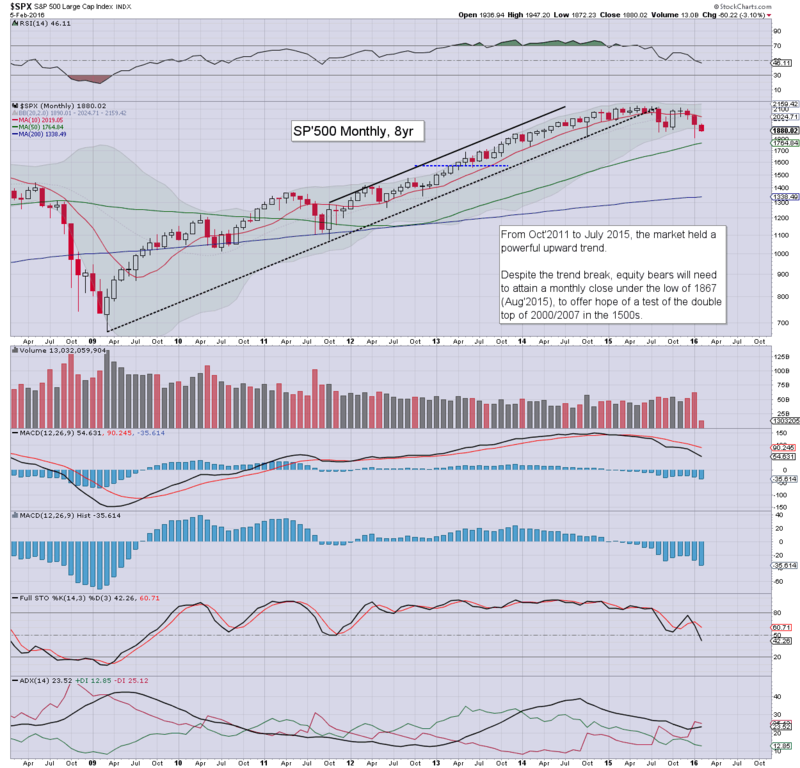 The sp'500 looks set for the 1600s within the next few months. On a multi-decade perspective, the double top of 2000/2007 - sp'1553/76, should hold, before hyper upside across the next few years. 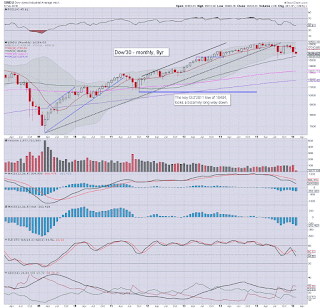 February has started on a very bearish note, with a net weekly decline of -60pts (3.1%), settling @ 1880. 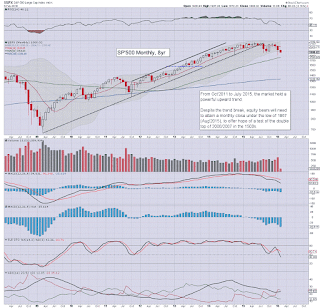 The monthly 10MA continues to spiral lower, now offering upside resistance at 2019. At the March open, the 10MA will likely be around 2K. Sustained action >2K looks out of range for many... many months. Underlying MACD (blue bar histogram) cycle is ticking lower, now at levels last seen in May 2009. 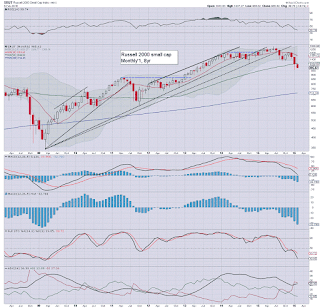 At the current rate, the MACD (black line) will likely cross below the zero threshold in late March/April. Best guess: renewed short term upside.. at least to the 1950/60s, not least if Fed chair Yellen 'inspires' next week. 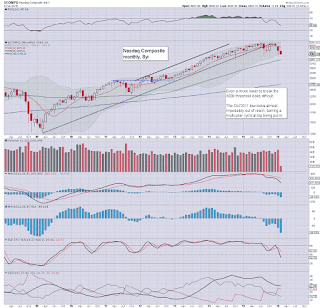 Regardless of where any such bounce maxes out, the sp'500 is headed far lower into the spring. The Nasdaq was especially hit on Friday, resulting in a net weekly decline of -5.4%, rather close to the January low of 4313. First big target is the 4K threshold. From there, the 3000/2750 zone looks viable, which is more than 40% lower from the July 2015 high. The mighty Dow is currently lower for the third consecutive month, settling the week -261pts (1.6%) at 16204. 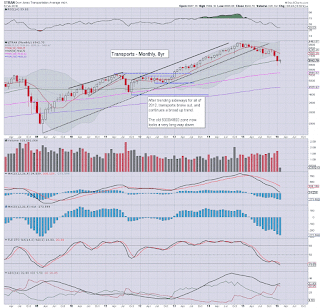 First resistance of the 10MA is at 17161, but that is set to spiral lower into the spring. 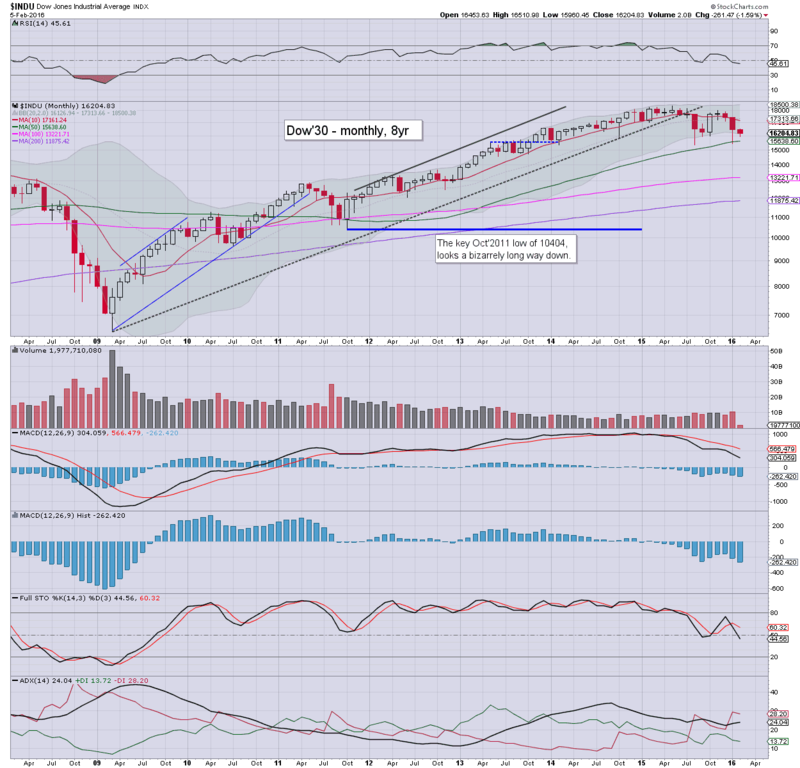 First downside target for the equity bears should be a monthly close <16K, which will open up next support in the 14200/000 zone.. where the 2007 peak (14198) lurks. As things are, sustained action <13400 looks difficult. 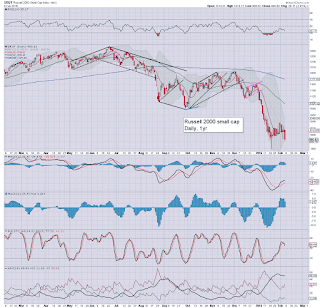 The master index continues to slide, net lower on the week by -2.5% @ 9390. The 8000 threshold looks highly viable this spring. 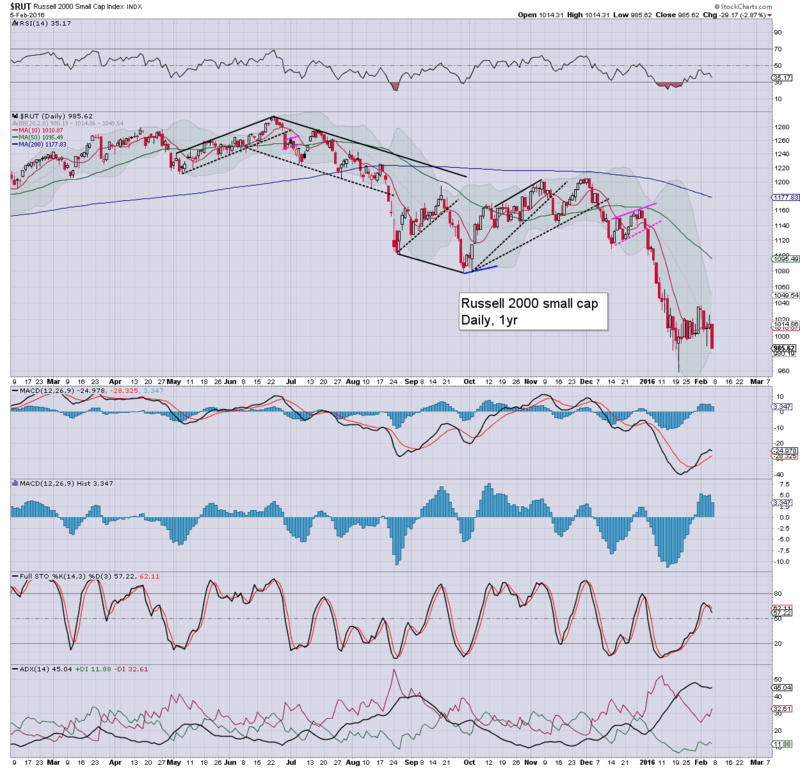 The second market leader - R2K, saw a rather brutal net weekly decline of -4.8%, settling @ 985. Regardless of any near term bounce (first resistance 1030/40 zone), much lower levels look due. Next big downside target is the 875/850 zone. 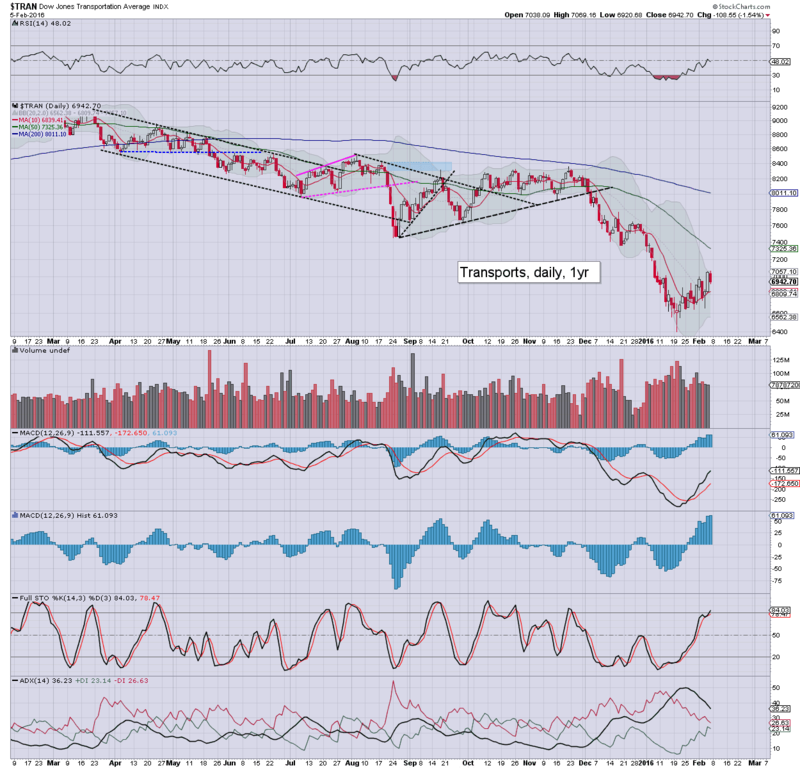 The 'old leader' - Transports, was the anomaly this week, with a net weekly gain of 0.5%, settling @ 6942. 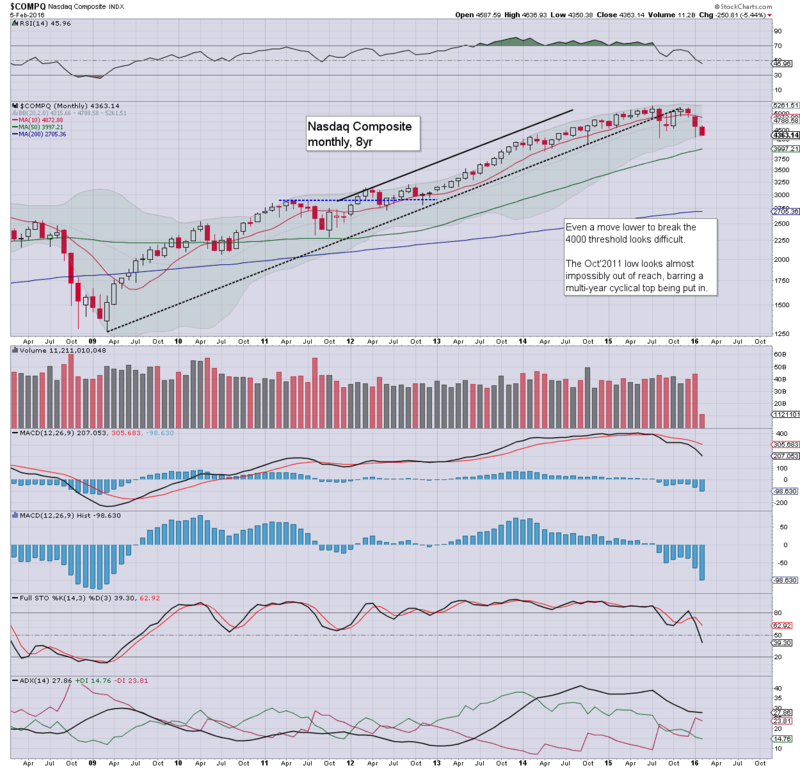 However, like all other indexes, regardless of any near term bounce, broader downside to the 5500/5000 zone looks due. Best case downside is likely no lower than 4500. 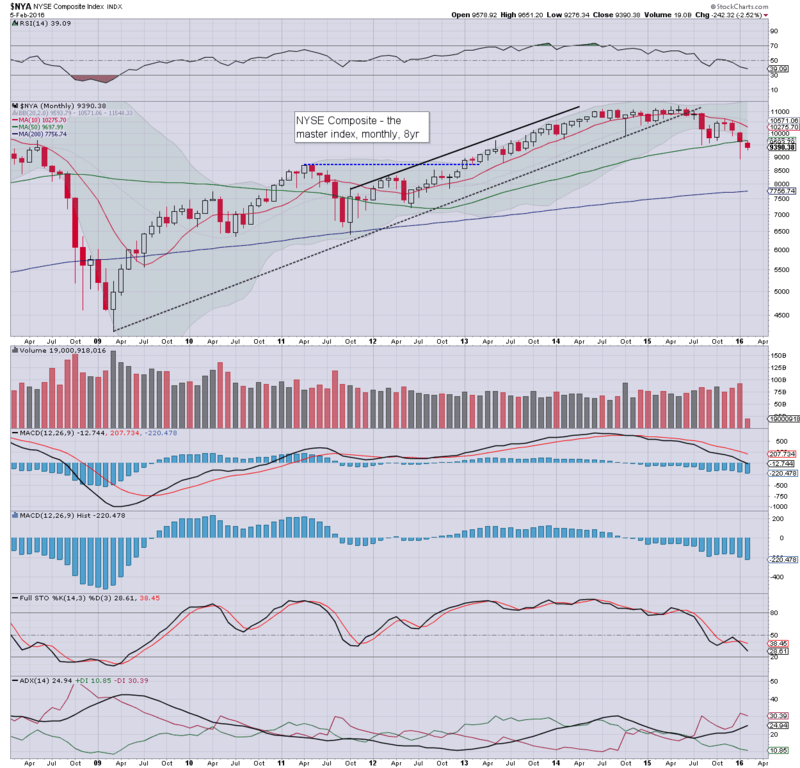 It is extremely notable that 4655 would be an effective 50% crash from the Nov' 2014 high of 9310. 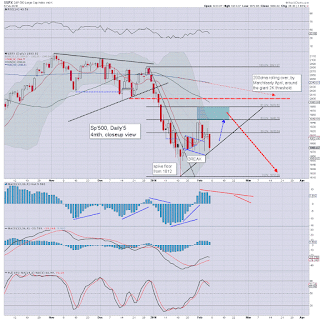 Unquestionably, the mid term outlook remains increasingly bearish. 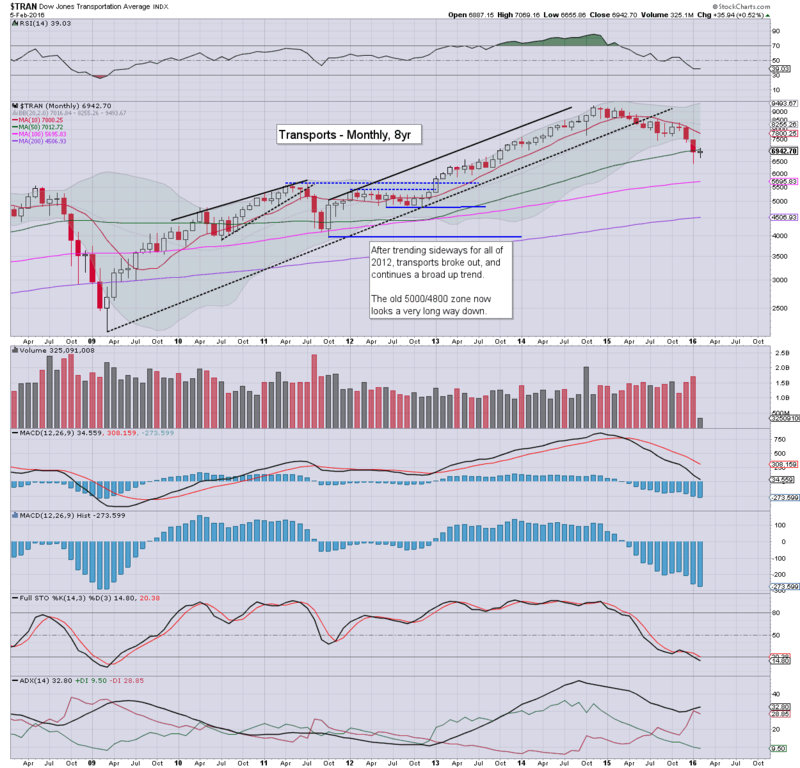 It would seem most indexes are set to decline by a further 15/20% within the next 2-3 months. Indexes syncing up for this? 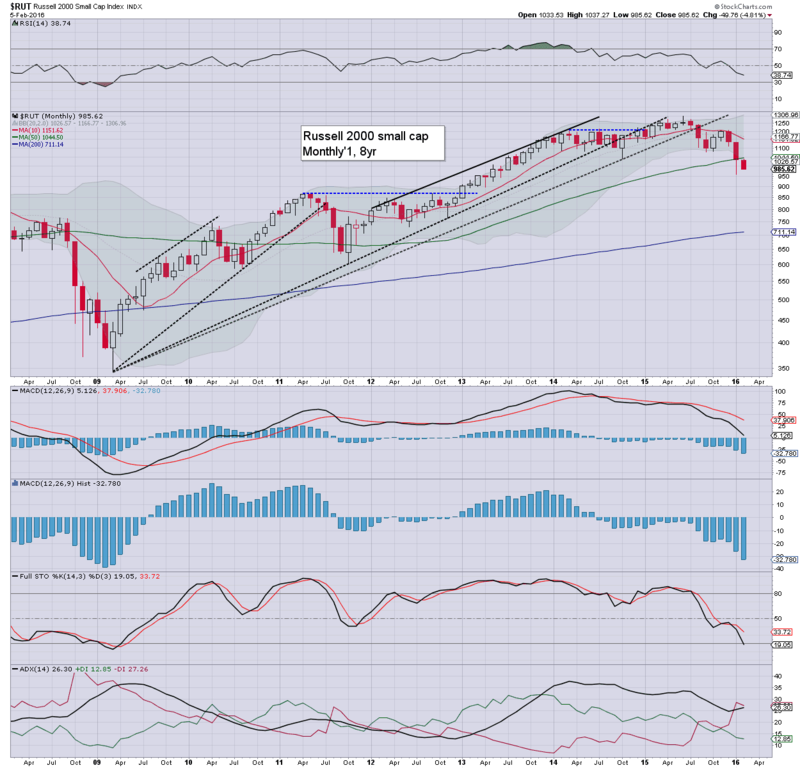 Until the equity bears can attain a monthly close under the old double top of 2000/2007, which in the case of the sp'500 is 1553/76, I am still highly concerned that the market will floor by early summer, and then see hyper upside into end year.. even to new historic highs in some indexes. We're still due industry capitulation within the oil/gas/mining sector. Some of the listed mid tier names are set to disappear. 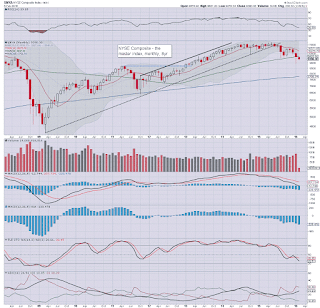 Those equity bears seeking anything <1500, are going to need to see the 1400s by May. To me... the clock is ticking, and now its a case of how powerful the next multi-week down wave will be. The coming week will center around Fed chair Yellen, who is due to testify across Wed/Thursday to the US house/senate. The only data of particular note will be retail sales on Friday. 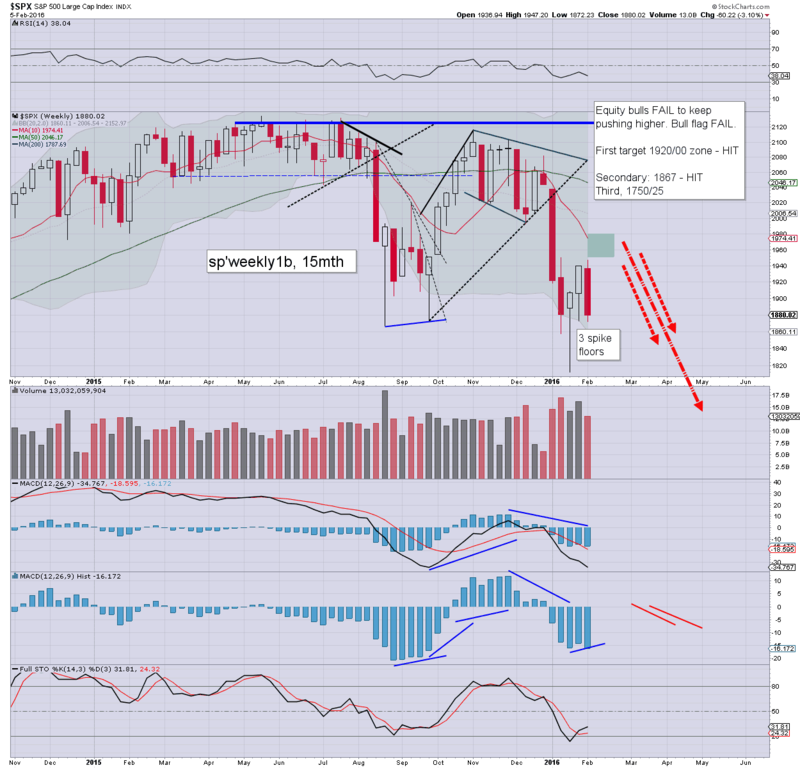 It was a very mixed week for US equity indexes, with the sp' breaking a new cycle high of 1947 on Monday, but then seeing rather significant weakness into the weekly close. Across the week, the sp'500 settled net lower by -60pts (3.1%) at 1880. 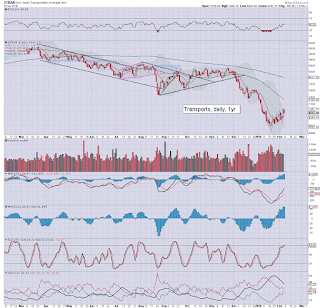 Near term outlook remains bullish to the 1960/80 zone. Its been a pretty interesting week in market land.... and I'll leave it at that. 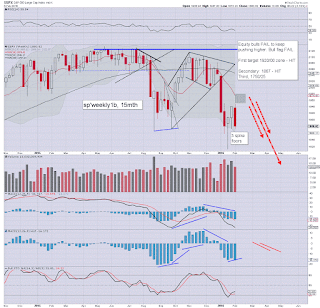 Price structure in the R2K is already suggestive of a bear flag break/confirm, but the trans is not as bearish. Best guess: broadly.. another push higher still looks due next week.